I remember spending the night with a friend, as a teenager, and coming to the breakfast table to find a bowl of wall paper paste…okay it looked, felt and smelled like the paste my mom used to hang wallpaper. Come to find out, that mush was Cream of Wheat. I choked down a little of it and stirred it around for the rest of the time. Fast-forward about 5 years to college. My roommates were buying boxes of Quaker Oats in the variety pack- you know: Cinnamon Apple, Maple Syrup, and Brown Sugar. And I tried it. And I liked it okay. Not enough to make that the mainstay of my daily breakfast- my favorite meal of the day! But I didn’t gag and the flavor helped to redeem my Cream of Wheat incident. Then fast-forward about 10 more years and I’m standing in line at Fido Coffee Shop and I see a big bowl filled with creamy oats and fruit pass by in a server’s hand and I say “Ooh! That looks delicious”. And I had to taste for myself. So I ordered myself a bowl and it was indeed delicious! Creamy oats, topped with a generous sprinkling of dark brown sugar, and a mound of sliced strawberries, bananas and raisins. Now that’s what I call Oatmeal! I fell in love. And ever since, I have been making bowls of creamy oats with loads of toppings! The possibilities are limitless. You can top oatmeal with all kinds of fresh and dried fruits and nuts. Go crazy, get creative! When I need a hearty beginning to the day, this is my go-to meal. I have my daughters hooked too. Currently brown sugar is their only essential topping. I even ate oatmeal for dinner when my dear friend Catherine (Catherine of Salsa fame) came to town recently. We were having a late night meal and decided oatmeal would be nice, and you know, it made for a lovely winter snack-supper. Or perhaps it was the company that made the meal seem so enjoyable. (curly girl design)…I’m a big fan of her designs and quotes. 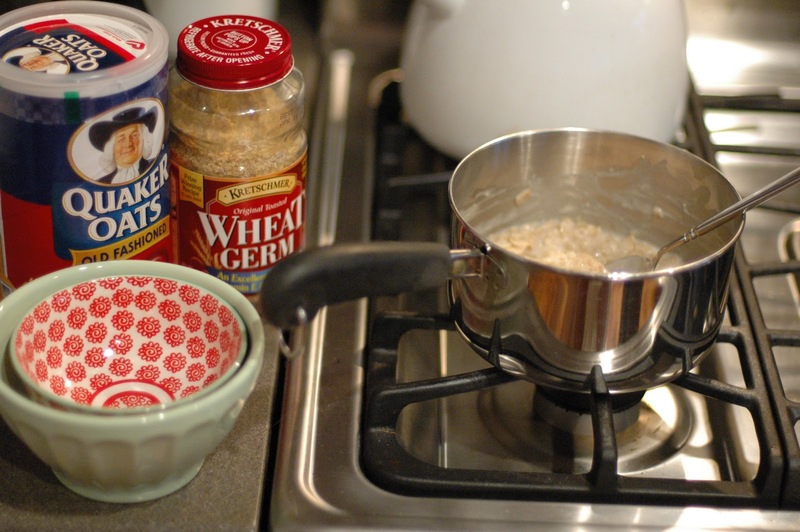 I have tried many different varieties of oats and cooking methods in order to find my favorite. I encourage you to do so too. It seems there is much debate on what makes the best oatmeal. I have tried Quaker Oats and generic/store-brand, Old Fashioned and Instant; as well as Steel Cut Oats. 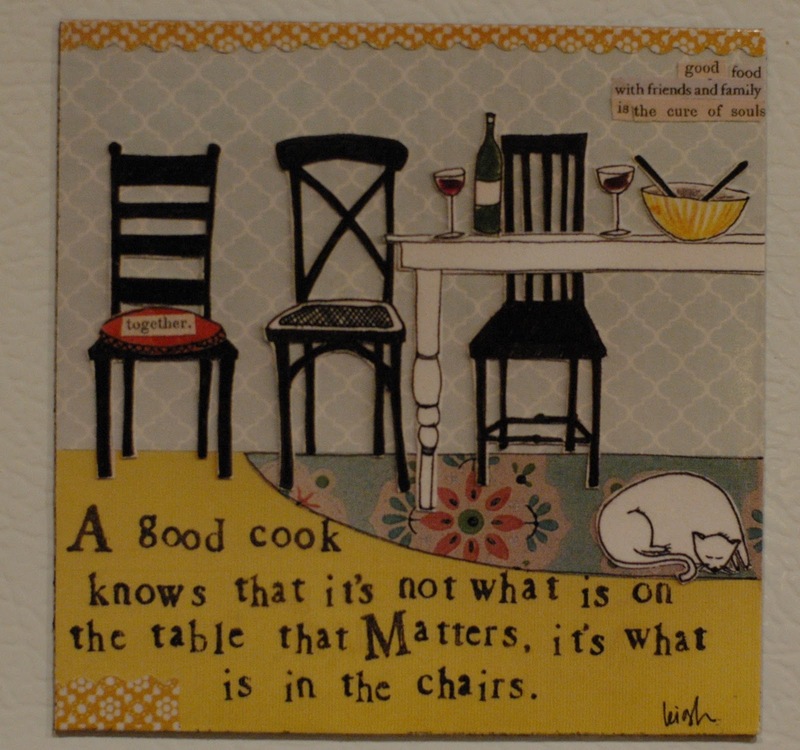 I have cooked them on the stove top and in the microwave; with water and with a portion of milk. There are pros and cons to each. I think my favorite is Old Fashioned Oats with a couple of tablespoons of wheat germ added, made on the stove-top with part low-fat milk and part water (which makes them just the right amount of creamy), topped with brown sugar, dried cranberries, walnuts and diced bananas. I mean, with those toppings, even wallpaper paste might actually taste pretty great! What’s your favorite way to do Oatmeal? i have oatmeal almost every morning too. i work the opening shift at starbucks, and so i have access to steamed, hot milk in the blink of an eye. my two favorites are vanilla soy milk and apple juice. while the second is not creamy, the flavor blast is amazing, and removes the need for any sugar. chopped nuts make a great addition to this version, as does dried fruit–try cherries! I swear you're reading my mind! I just bought a big tub of dried cranberries for oatmeal. I actually made Oatmeal Cranberry Pancakes the other weekend, which made me want to make my Baked Oatmeal, which has made me want to figure out a good creamy oatmeal combination. I know what I'll be trying tomorrow morning! I am so glad we are forming an Oatmeal fan club! Jenn, I have never thought about steamed apple juice in my oatmeal but it totally makes sense. 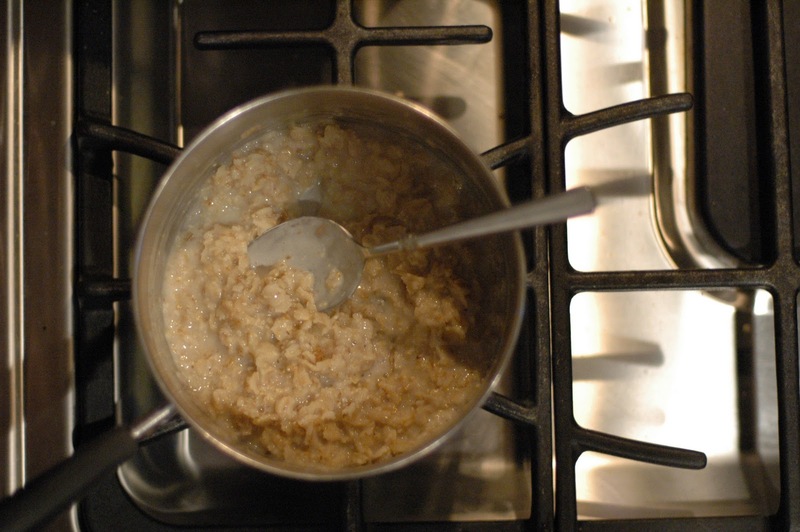 I love Starbucks' carmel apple cider, so I am imagining it meeting oats…yum! Too bad you don't work at the Starbucks down the road, I'd be popping in for some of your oatmeal creations! To be honest, I cannot say I love oatmeal that is not until I ate your granola. I loved it so much I have been adding it to my purchased cold cereal for a hearty breakfast. So….. I am going to branch out and try your cooked oatmeal. I am working to reduce my LDL cholesterol and I have read that the oatmeal as well as the nuts are good at helping reduce it. Thanks so much for these tips, and I will let you know how it goes. By the way…. I grow my own figs, and after drying them I freeze them to keep them from molding. Might try them on top along with nuts and bananas. Patsy, I am so glad you are loving the granola and that you are thinking about giving the Oatmeal a chance. Your figs sound great. You grow figs and pecans… I'm impressed. Let me know how it goes! I have been eating mine with maple syrup and a heaping tablespoon of natural peanut butter. (need the protein for my diet) It is to die for. You should give it a try. yum! Peanut butter and oatmeal. I will try it! You are my peanut butter friend!! My favorite way to eat my oatmeal (quick oats made w/ water in the microwave) is with peanut butter and chopped dates with a splash of milk. You should try Baked Oatmeal – I'll have to email you the recipe, but it has sugar, egg and milk baked in then you add your own toppings once it's out of the oven. I don't need lunch it's so filling. Ooh! I am so excited you posted on oatmeal, because about two days ago I made baked oatmeal and LOVED it and wanted to tell you about it. I actually ran across a recipe in the GCC cookbook, which always makes me think of you. I had read a suggestion that baking your oatmeal in a loaf pan, storing it in the fridge and slicing off a portion to heat and add toppings to is a great, easy way to do mornings on the go. Love it. I like to cook my oatmeal with whole milk & a little bit of water. Very creamy. Then, I add a tablespoon of Nutella and a handful of dried cherries. Delicious!